In 2012 S.T. 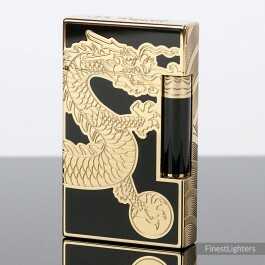 Dupont celebrates the Year of the Dragon with this wonderful Limited Edition lighter, finished in pale gold and finely engraved with a golden dragon on a black Chinese lacquer background. The lighter comes with a double flame burner. Only 888 individually numbered pieces were made.